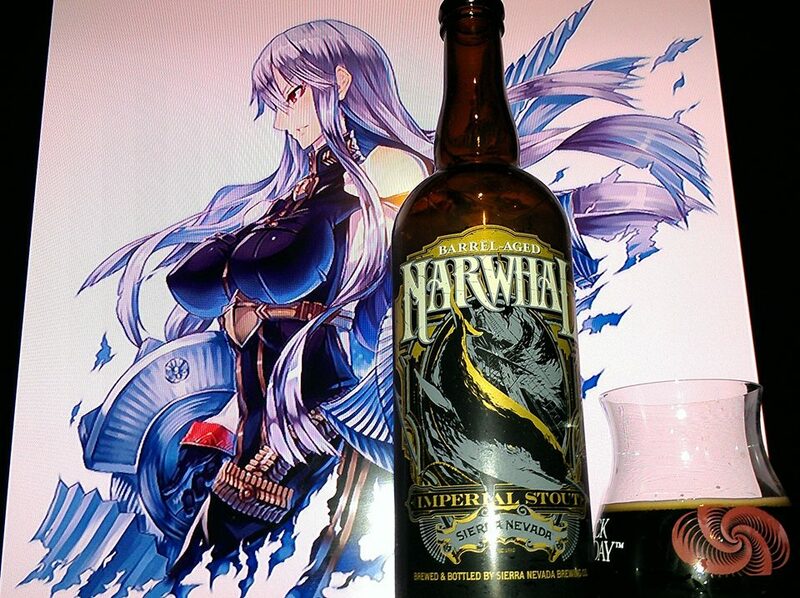 Barrel Aged Narwhal by Sierra Nevada is a 12.9%%ABV World Class Russian Imperial Stout aged in Kentucky Bourbon Barrels. The Jedi of the Sea has returned to save the beer world of whalez. Well, this one is a pretty elusive and will be more so as time goes on. Released in very limited quantities, this one is already a sought for item as the original beer was a major success for Sierra Nevada and is definitely one of the best Russian Imperial Stouts out there. It is my hope that this beer does turn out to be the hype it deserves otherwise, it might as well just get lost in the sea of beers altogether. 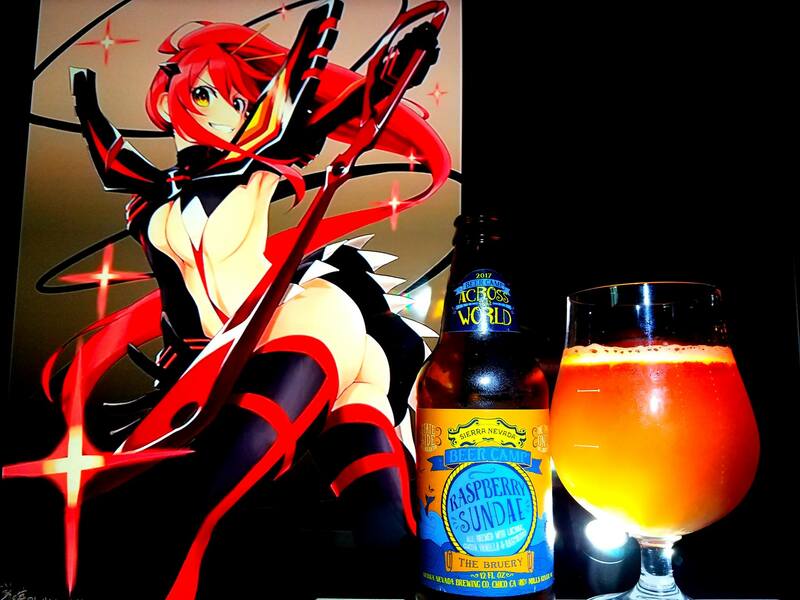 Let’s take a look at this rare opportunity to learn more about this beast in nature… Cheers! Lots of bourbon oak forward, toasted coconut, espresso coffee, mocha, dark chocolate, milk chocolate, roasted coffee, vanilla, whiskey bourbon, rye bread, whipped cream, marshmallows, chocolate smores, Khalua, smokey hints, dark fruit currants, prunes, raisins, figs, flan, brown sugar, banana hints, pecan pie, hazelnut, minty hints and molasses. Dark chocolate, milk chocolate, Bakers chocolate, chocolate abuelita hints, vanilla, oak bourbon, flan, sweetened condensed milk, dulce de leche caramel, roasted coffee notes, espresso notes, Khalua, mild smokey oak, dark fruit prunes, currants, raisins, mild cherries, figs, mocha, toasted coconut, marshmallow cream, chocolate smores, graham crackers, molasses, anise, mint, rum hints, whiskey, port wine hints, rye bread, leather, tobacco, whipped cream, brown sugar, Irish cream, bananas, pecan pie and hazelnut nectar. Marshmallow cream, oak, leather, caramel, chocolate,coconut, bourbon, earthy notes, rye bread and vanilla with an almost dry finish. 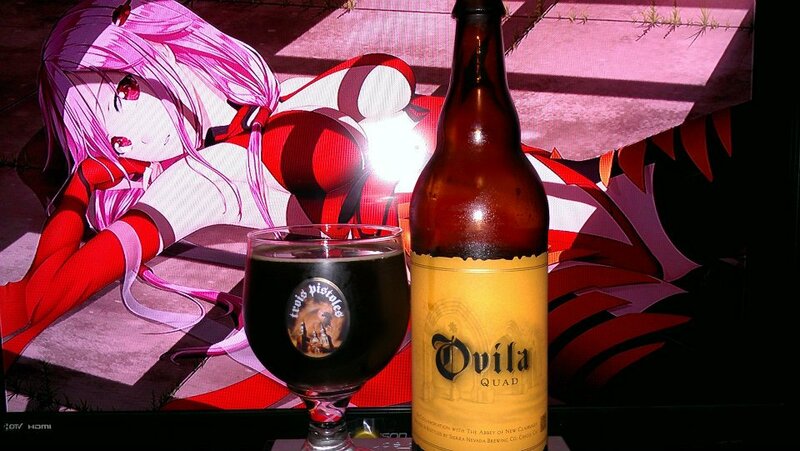 No alcohol in the taste, silky and creamy mouthfeel, drinks easy despite the ABV and pitch black motor oil full body. The Jedi of the sea struck with a hard vengeance brought forth from learning its way in the dark side. Now accepting its darkness, it can now deliver you into a sweet world of awesome. This beer is similar to the Barrel Aged Old Rasputin except this one has more barrel, dark chocolate, roasty coffee and coconut flavors forward along with the complexities I was able to explained as I tried dissecting this one. This is one of the best Russian Imperial Stouts out there but next to Darkness, well that’s just another dimension. 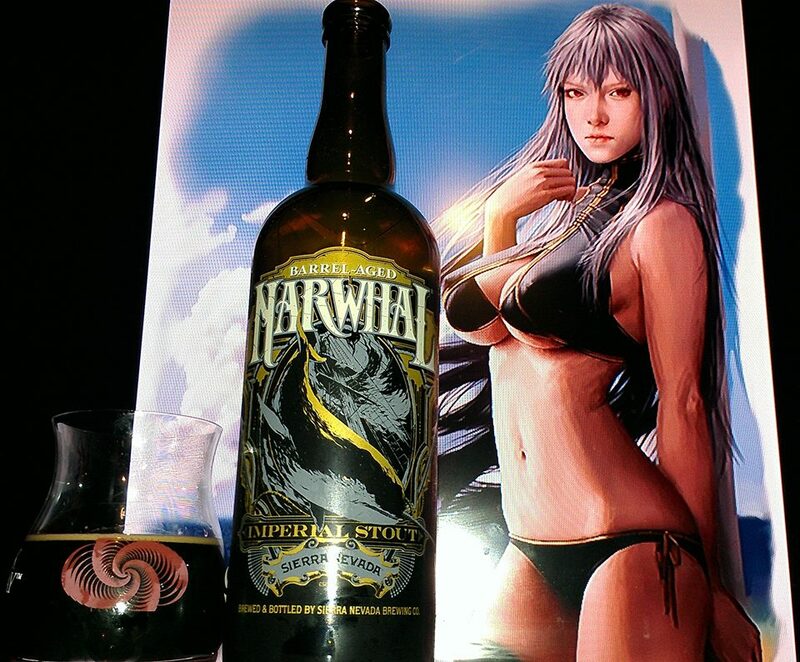 Still, a whale by name enters its glory into fame when it comes down to the most coveted beers to claim. Highly recommended and possibly their best beer ever! Selvaria Bles from Valkyria Chronicles was used in this pairing since I wanted to show someone that would be similar in color even to a Narwhal as well as a general or captain of a ship. In the original Narwhal, I showed a captain of a ship with a map basically looking for the legendary beast. Here now we can see the similar map and as Selvaria dashes into the adventure, it represents her in search of the beast. You can also see that her armor, shield and sword look similar to the Narwhal, not to say she killed one, but maybe, since it is a part of her and changes shapes, it is almost as if she is the very beast she searches for and doesn’t even know it. 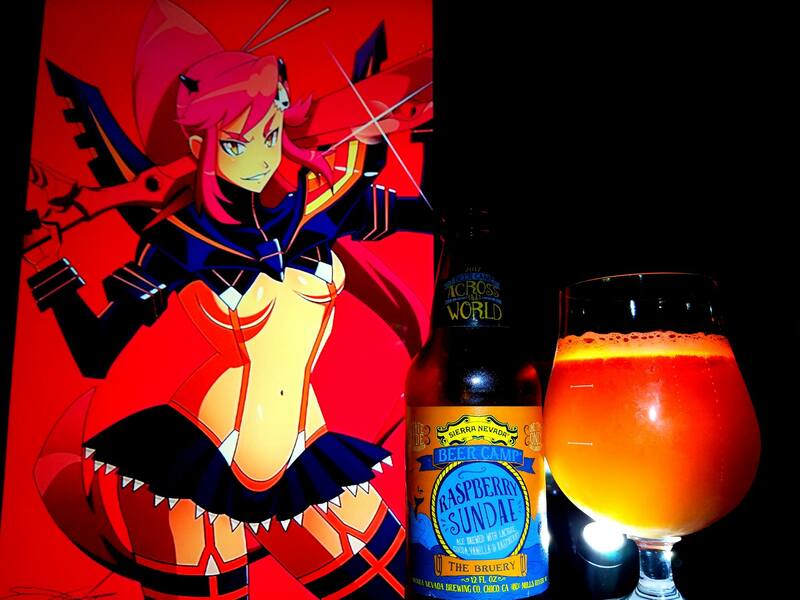 As you can see her in the bathing suit, this pairs well with the colors of the label as well but also represents the smoothness and silky aspect of the beer as it was barrel-aged afterall. 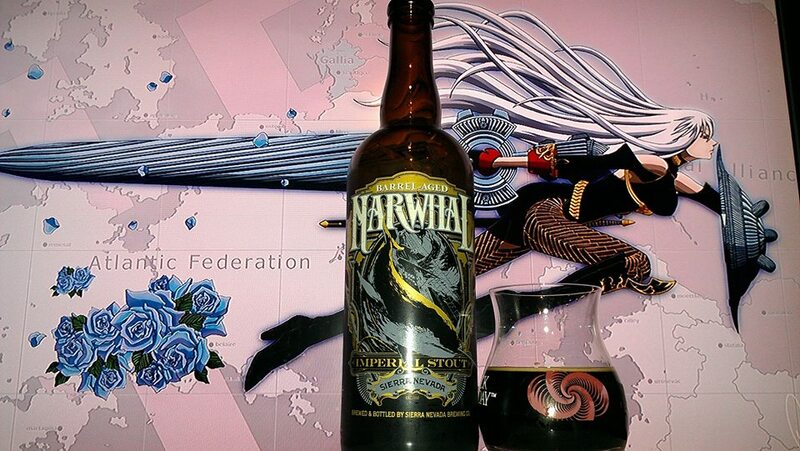 Plain and simple, she is Jedi of the Sea, she is the Narwhal! Bigfoot is a beast of a beer, brimming with bold flavor from massive amounts of roasted malt and spicy hops; brewed in the barleywine style, with a rich, bittersweet body and whole-cone Pacific Northwest hops. First introduced in the winter of 1983, Bigfoot is a cult-classic beer brewed in the barleywine style, meaning a strong, robust, bruiser of a beer with the refined intensity of a wine. Bigfoot is prized by beer collectors for its supreme cellarability. Under the proper conditions, it can age like a fine wine, developing new flavors and character as it matures in the bottle. Each new release or “expedition” is vintage dated. Collect your own and see the flavors develop and progress. Barleywines are the type of beer styles that that range from bitter to bittersweet and are intense in terms of alcohol, hops and complex flavors. They can also be cellared to age like wine. This beer has avery nice grassy and pinecone hop aroma, with other fragrances of caramel, lemon peel, honey, pineapple and biscuit bread. The flavors are of the nice Sierra Nevada pine cone, grassy hops at mild bitterness, pineapple, raspberry, apples, caramel, toffee, powdered sugar, cinnamon, butter on toast biscuit bread and slight boozy feel. As I said, these beers get better with age. This is probably too early in its stage but it will probably get a lot better after a while.